Having collapsed chronological time and suggested that narrative intervention can be best accomplished by ostentatious, aggressive, and joyous queering of Mesopotamian mythology in his The Book of All Hours, it was somewhat inevitable that Hal Duncan would eventually try to enact the same ritualistic transformation on Christianity. Testament is not a surprising development in the thematic arc of Duncan's work; what it is, however, is a vivid and personal use of his previously explored thematic architecture, embedded in both a pointed critique of institutional Christianity and a substantial engagement with both the received text of the Gospels and a multitude of suppressed, forgotten, or discarded early Christian materials. Duncan approaches his project—which, in simplest summation, is a call to receive revelation—with the eye of a Byzantine scholiast or a present-day Talmudist. The book is a constructed Gospel, which intercuts the text of the story of Jesus (here rendered "Joshua")—primarily (but not entirely) assembled directly from the Gospel of Matthew—with the commentary of the narrator/assembler, who addresses his work to an unnamed "lover of the sublime," a modern Christian bigot, whose primary characteristics are homophobia and anti-Semitism. The intercutting of the text is visual: when I say that Duncan has performed the work of a scholiast, I mean that he has produced a book which is laid out like a Byzantine manuscript of biblical commentary. The assembled Gospel text is printed in two columns, like the traditional layout of many printed Bibles, while the commentary of the narrator/assembler appears in a single justified column: simultaneously surrounding the Gospel text and visually marked as less "authoritative." This layout choice is an integral and effective part of Duncan's composition. The aim of the assembled text is no less than to produce a Christianity without "Empire"—an uncorrupted, non-institutional Christianity which has no conceivable place for the lover-of-the-sublime who is a bigot. The text thus acts as a magical rewriting of the history of Christianity, which, if it succeeds, not only transforms the world but the lover-of-the-sublime. The narrator/assembler himself has many identities: at various points he is Judas, Lazarus, the unnamed "beloved student" of Joshua, and Joshua himself after his resurrection. He—along with the text itself—is also unmoored in time, drifting between Roman Jerusalem, the present moment (marked by references to Anonymous and the gay marriage debate, and sometimes too on-the-nose for this reader), and all of the two thousand years between. The collapse of time is deliberate and significant for the project of the book, as it asks the reader (who may or may not be the addressed lover-of-the-sublime) to participate along with the narrator (who may or may not be Hal Duncan himself) in a reimagining of two thousand years of bloody ideological history, and arrive at the end of the book at a state of grace. This state of grace is explicitly anarchist, anti-imperial, and queer. If there is one consistent characteristic which the narrator/assembler maintains throughout all his transformations, it is the state of being a gay man: and thus the reimagined gospel is a radically queer gospel, in which transgressive desire is centered. Some of Duncan's reimaginings exploit this queering to great effect: his reinterpretation of Joshua's last words on the cross is strikingly, squirmily uncomfortable in its personalization and intimacy, while simultaneously allowing for the presence of a raucous joy. Moments like these are where Duncan most succeeds in his project: when the connotative associations of the gospel text contrasted with the narrator/assembler's intercut interpretation allow for a new vision of a familiar scene. This is the real goal of the scholiast—superposition of interpretation and connotation in order to produce new insight. When Duncan manages it, Testament is a success, and one which is emotionally and psychologically compelling. Frustratingly, he does not manage it consistently. Part of this failure is that fully 60 percent of the text of Testament is, well, the New Testament, especially in the first few chapters. Duncan does his best work when his alterations are visible: the rewritten Annunciation is extremely good, for example, bringing both a feminist and a pro-immigrant reading to Gabriel; as is the entire post-resurrection sequence, which intercuts the lost Gospel of Thomas, the suppressed Gospel of Mary Magdalene, and the narrator/assembler's own commentary on his personal transformation. However, there are long sequences where the alterations to the well-known story are really only accessible to someone who has a deep familiarity with not only the original Matthew text but also all the other intercut sources. As the book progresses to its inevitable and climactic second half, in which the narrator/assembler plays out the sequence from Gethsemane to Resurrection, the frequency of the narrator/assembler's commentary—and the transparency of this commentary's purpose to the reader—increases. The greater presence of this original voice, particularly when he finally explains both his desired goal and the received revelation which has enabled him to conceptualize it, makes the latter half of Testament much more engaging. It also brings in real stakes. The story of Jesus is, after all, one to which we know the ending—and we also know the story of the institutionalization of Christianity over the subsequent two millennia. Only halfway through the book does Duncan begin to suggest possible alternatives. Until then, the interjection of the narrator/assembler's voice is primarily employed to remind the reader of the bigotry and excess of the worst versions of modern Christianity. This often feels like it is meant to shock the reader. I, at least, am not shocked: one could wish that hatred, blood libel, and fascist brutality were unexpected in a modern Christian context, but they are not. Duncan's attempts to use them to evoke desecration fall flat. However, the narrator/assembler's evolving revelation, especially as he slips free of any one sequential chronotope, brings in a level of pathos which is personal and vivid. The more the narrator/assembler intervenes in the story, and the more that his interventions turn out to be futile or incomplete, the more compelling Duncan's retelling becomes. 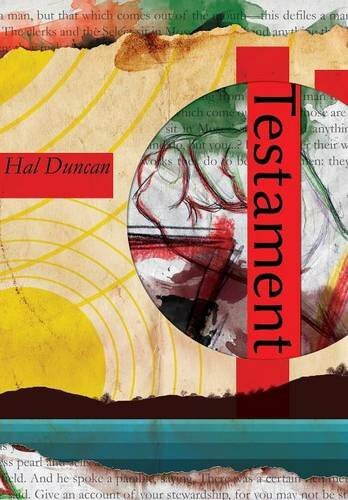 Essentially, Testament is strongest when Duncan gets out from under his conceptual framework—while the intercut, scholiastic text is immensely rewarding to someone immersed in the long and sordid history of the canonization of scripture, it is the character of the narrator/assembler who is compelling. His collapsed/multiple identity is the place where Duncan's trick of rendering story-space fluid and asynchronous works best. Testament's ambition is very large, and Duncan's engagement with his material quite profound. More than once while reading I was compelled to retrieve not only my copy of the New Testament in Greek but also a collection of gnostic gospels from my shelves, in order to be sure that the intertexts I thought he was referencing were actually what he was referencing—and they almost always were. The book succeeds on both a scholarly and a theological level, in that it presents a viable and internally coherent spiritual ideology constructed from available evidence and interpretation. Where it does not always succeed is on the level of story-engagement; the reader, whether or not they are the lover-of-the-sublime, is left wishing for more access to the narrator/assembler, and perhaps less reconstruction of his testament.